Antarctica is not all about fun in the snow; our highest priority for the duration of our visit here is research. Charges, defined as multiple packets of rock substrates with different mineral contents and glass slides, have been exposed to the environment for periods of up to four years. Upon retrieval these charges have to be archived, i.e., processed with various chemical fixatives and low temperature freezing to preserve the microbiological communities and their signatures and to make them ready for transport for analyses back in the lab. The first step in archiving is, of course, to retrieve the charges that were put in place four years ago. 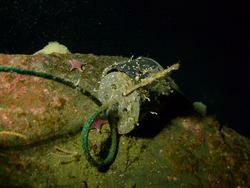 Our first charge collected during this season was from a dive site near Cape Evans Wall. In addition to our samples inside of the container, we found a couple of starfish, a crab spider, as well as some sea worms which were added to the touch tank in the McMurdo aquarium lab. After opening the charge, the packets are processed in various ways which will be used to look at the microbiological colonization that results after exposure using various techniques, including DNA work and later culturing in the lab.